The San Diego Master Gardeners spring seminar is back and registration opens tomorrow, January 31st. This year they are offering 3 sections of classes on April 2, 2011 that start at 8:50 a.m. with the last section starting at 1:40 and ending at 2:50 p.m.. If you pre-register classes are a mere $15, with a $5 dollar discount if you sign up for three classes. They have a very well rounded schedule of classes and instructors this year. The classes are going to be back at the USD campus this year. 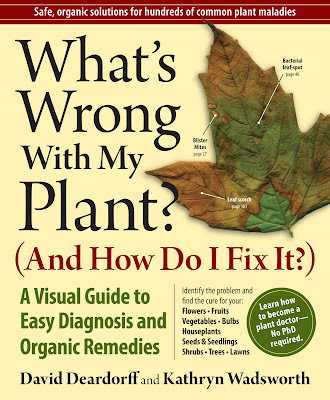 The What’s Wrong with my Plant team of David Deardorff and Kathryn Wadsworth are in town to help us all answer the seemingly year round, life long question, what the heck is wrong with my plant? 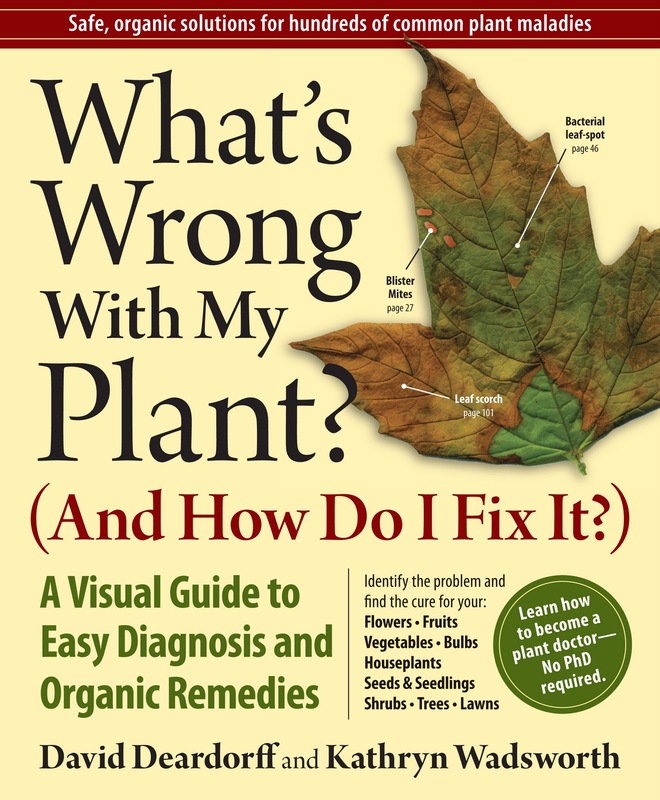 Their widely successful book of the same name has been a godsend in identifying everything from random black spots to yellowing leaves. Not only do they help you identify the problem but they help you find a solution the organic way. I’m very excited to get to meet these two in person! Hurry and sign up online, the class is this Saturday the 29th from 10:00am-12:00pm at the San Diego Botanical Garden. 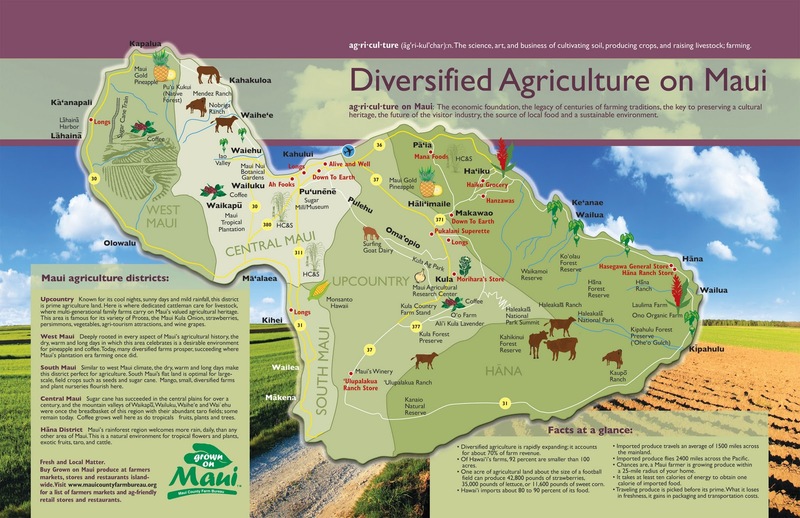 O’o farms is located in the lush green hillsides of Maui’s upcountry region. The farm exclusively provides all that it grows to three restaurants on the island of Maui. They average 34! inches of rainfall a year and are often under a misty cover during the winter months. Even so the farm is equipped with drip irrigation because it can really get hot and humid. When you arrive at the farms the first thing you notice is the breathtaking views, overlooking both the north and south coasts. First to greet us was Richard Clark the farm manager who has been playing in this dirt for ten years and is obviously passionate about the land which totals 8.5 acres of virgin! territory that was once home to a thriving population of eucalyptus trees and hippies. This soil is the rich choclate cake color and texture we have all been craving and can never quite attain no matter how much compost we amend into it. I have now figured out the secret, get your own volcano! I was happy to learn it’s not all perfect soil and ocean views, they have pest up here too. Thrips, aphids and snails are all regulars but the biggest problem is the humidity. I have enough problems with mildew as is but can you imagine an average of 70% humidity for most of the year in addition to 34″ of rainfall? Cucumber, squash and pumpkins as well as tomatoes aren’t fans of this climate so tend not to produce very well. O’o is all organic even though they cant legally say so, so no chemicals or pesticides. They use crop rotation, cover crops and row covers to help protect their plants. The farm gives tours twice a week educating those who attend about everything farm including composting, vermiculture, healthy soil, chickens and growing organic food. Speaking of chickens the farm has a great coop pictured below with a couple of wild roosters to keep the hens in check. Richard hopes to establish a rolling chicken coop here in the near future which I look forward to seeing. At the end of the tour guest are treated to a gourmet lunch cooked on site by one of their fantastic chefs Barry Clark. My dreams and imagination are in overdrive, especially upon hearing that O’o doesn’t need to do any outside marketing. This farm works with their three restaurants when planning what to grow and takes orders daily for each menu. In addition to the tours the farm sails full speed ahead with only four (very busy) helpers. I don’t know about you but this sounds like a dream come true. Kicking and screaming I’ve returned. We all had an amazing time and were welcomed with open arms at O’o Farm and Haliimaile Community Garden. We also toured several native botanical gardens that are hard at work preserving endangered species and agricultural traditions. It was truly an honor to share my time learning about farming on Maui and meeting the wonderful people behind the cause. Of course plenty of pictures are on there way, but in the meantime here are a couple from different hikes on the island. Seeds in the City is off to explore island farming life for the next ten days. I found this great map on the Maui County Farm Bureau website that shows all the different farms and gardens. I will be volunteering at O’o farms and I can’t wait to see how things are done over on the island. There will be MANY photos to follow. Please let me know if you have any suggestions on places to visit. As a lover of Italian cooking, mostly due to my infatuation with bread and cheese, I frequently utilize many different varieties of mushrooms in my cooking. They can get rather expensive once you start getting into the gourmet varieties so we have decided to grow our own starting with Portobellas. I’m hoping to get all the necessary information at this years mushroom fair which includes cooking and growing demonstrations as well as volunteers on hand to identify your own ‘found’ mushrooms. Hope everyone had a wonderful holiday, now back to work! Our first post of the New Year focuses on some very late/early spring cleaning we have had on our list since our very first post where we lost our beloved artichoke. Finding it unfathomable that a gopher could exist in a concrete jungle we searched for possible reasons as to why our plants roots were disappearing overnight. We settled on some sort of soil borne disease that fed on our plants because we had never seen any signs of a gopher. I grew up in a yard of gophers and could see their mounds and tunnels from a mile away. Well it turns out that our gopher is very sensible of this fact and has managed to keep a very low profile, until recently. Two dead Borage plants later I finally spied a tunnel and then a mound of dirt. Now, I’m the last person who would kill anything, I save daddy long legs for gosh sakes but this guy has taken it too far. I called in our resident gopher expert for some sage advice on ending this little guys reign of terror. Her first advice was get the right trap. Essentially the metal style is the best, the one featured on the video has been passed down through generations of gardeners but a similar style can be found at Home Depot. Secondly we looked for the most active hole and we opened it wide up to fresh air and plenty of sunlight. Now it’s time to set the trap. 1/7/11 The only thing the trap caught was a bunch of well packed dirt, to be continued…. 1/10/11 Well R.I.P Mr. Gopher, you will not be missed. After the third try and much WD-40 we were successful in our efforts. The scene this morning reminded me of instances where I have come upon a car collision and cannot quite fathom how it was possible for the cars to get themselves in there respective locations. The gophers main hole where the trap was placed was filled with dirt and nasturtium remnants and he was outside the hole. Go figure.